NEW ORLEANS (AP) Auburn’s Sean White completed a few impressive passes during his team’s touchdown drive to open the game, leading the Tigers downfield with ease. All appeared fine with his injured right throwing shoulder, which caused him to miss the final two games of the regular season. White suffered a broken right forearm during a 35-19 loss Monday night to No. 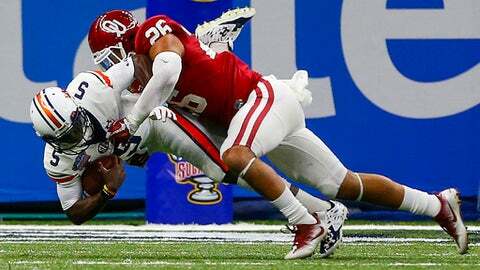 7 Oklahoma in the Sugar Bowl, and the injury completely derailed No. 17 Auburn’s offense. When the sophomore left the game in the second quarter, the Tigers had a 10-7 lead. But Auburn – with backups John Franklin III and Jeremy Johnson under center – didn’t score another touchdown until the final seconds when the outcome was already decided. A frustrated White had a sling and cast on his right arm during postgame interviews. He said he was actually injured in the first quarter close to the end of the first touchdown drive, when he was hit by a few Oklahoma defenders on a 3-yard run. Franklin – who had thrown for 179 yards all season until Monday – entered the game for White. He led Auburn to a field goal on his first drive, but couldn’t keep the momentum. Franklin finished 3-of-7 passing for 25 yards. After several frustrating drives, the Tigers turned to third-string quarterback Johnson, who was 5-of-9 passing for 93 yards and an interception. Auburn coach Gus Malzahn said Franklin also hurt his arm during the game, which affected his ability to throw the ball. Franklin said he ”tried to push through” the injury, but that his thumb kept locking up on his throwing hand. Auburn’s offense was often run-heavy this season, even when White was playing well. But the 6-foot, 200-pounder was efficient enough throwing that it gave the Tigers’ offense balance. It was a huge reason they had a six-game winning streak in the middle of the season. White’s early pass completions – a 12-yarder to Eli Stove and a 13-yarder to Kyle Davis – gave Auburn hope that the balanced offense had returned. But after the first drive, it quickly became apparent that something was wrong. White’s passes, even the short ones, were often well off the mark. He finished 4-of-10 passing for 35 yards. He was left on Monday night to talk about what might have been. But he also looked forward to the future.